This creamy mashed cauliflower gets extra flavor from the soft sauteéed leeks. 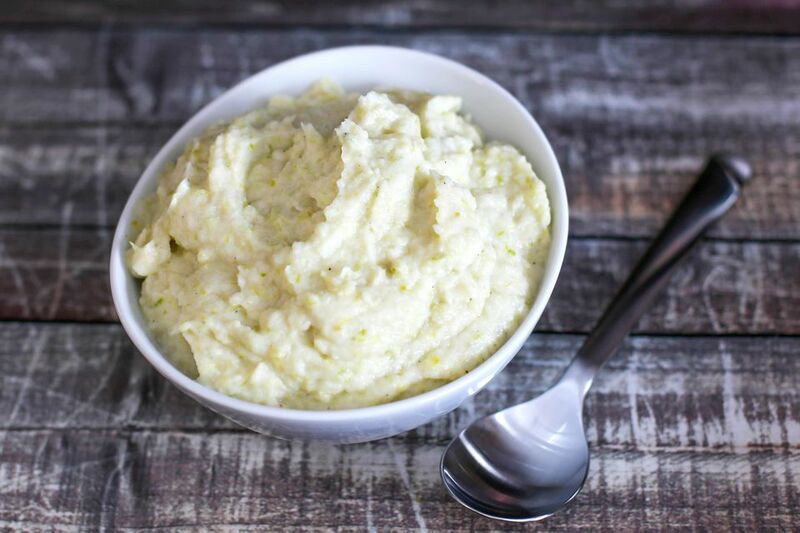 It's a super easy side dish to prepare and the dish is relatively low in carbs when compared to mashed potatoes. Leeks are not as common in the U.S. as they are in Europe, so they can be hard to find. And when you do find them, they tend to be pricey. Three or four chopped green onions may be used as a substitute. Heavy cream gives the dish rich and creamy texture, but go ahead and use light cream or half-and-half for a lighter mash. This is a delicious dish to serve along with any main dish meat, fish, or poultry. It will remind you of the Irish colcannon potatoes, but without the cabbage. The basic dish is tasty, but boiled cabbage, kale, or spinach would add some nice color and texture. And the extra green would make it an excellent dish for a St. Patrick's Day meal. Or add some grated Parmesan or shredded cheddar or Gruyere cheese for a richer mash. Meanwhile, clean the leeks. Cut the root end and dark green tops off the leeks and discard. Cut the leeks in half lengthwise and rinse under cold running water to loosen and remove any bits of sand within the leaves. Slice the rinsed leeks thinly. Place the butter in a large skillet and place it over medium heat. When the butter stops foaming, add the leeks. Reduce the heat to medium-low and cook the leeks for about 7 to 10 minutes, or until the are very soft but not browned. Stir them frequently. You might have to lower the heat more, depending on your burner. Add the minced garlic or garlic powder to the leeks and continue cooking for 2 minutes longer. Put the drained cauliflower and leek mixture in a food processor and add the heavy cream. Process until smooth. Taste and add salt and freshly ground black pepper. Alternatively, process the mixture using an immersion blender or an electric mixer. Spoon the mashed cauliflower into a serving bowl and enjoy! Add about 1 cup of chopped fresh spinach to the leeks along with the garlic. Continue cooking for 2 minutes or until the spinach is wilted. Add 1/4 cup of fresh grated Parmesan cheese to the cauliflower and leeks, or about 1/2 cup of shredded cheddar cheese. Replace the leeks with 3 green onions, trimmed and chopped.